Jason Simpson of ABC 33/40 was kind enough to share some forecast sounding data with me. EHI is a combination of CAPE (an indicator of instability) and helicity (an indicator of a storm's potential to rotate) values. Now I need to use a disclaimer here, but sometimes EHI values of 3-4 indicate the potential for strong tornadoes and EHI values over 4 indicate the potential for violent tornadoes. I am not saying this will happen, nor is anyone else, to my knowledge. 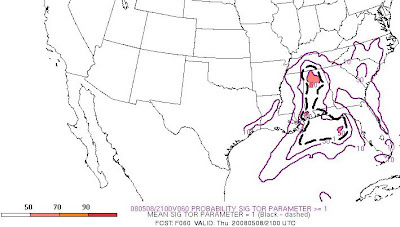 What this tells me is that models continue to persist with the idea that necessary parameters for a significant severe weather threat (including hail, wind, and tornado potential) will be in place tomorrow afternoon across North and Central Alabama. Please remain weather aware. My sincere hope is that no matter what the weather does tomorrow, there are no injuries or fatalities in the State of Alabama. OR anywhere, as Dewdrop so appropriately pointed out in her comment! 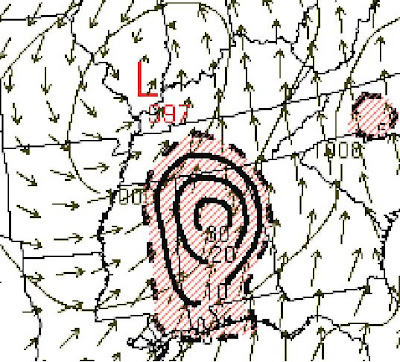 OF A CLEAR SURFACE BOUNDARY IS STILL ELUSIVE. NORTH AND GENERALLY CONTINUING TO WEAKEN OVER TIME. FEEL OF BEING LONG LIVED...ESPECIALLY FURTHER NORTH. PUT A LOT OF STOCK IN THE 0 TO 1 KM SHEAR VECTORS. WINDOW FOR THE SURFACE WINDS TO BEGIN BACKING WITH TIME. Or anywhere else for that matter... scary numbers, Mike.